It is our desire to help you find and fulfill the call of God on your life in establishing the kingdom of God on the earth. GCD offers Bachelor degrees, Associate degrees, and Certificate programs in Christian Leadership, Divinity, Intercultural Studies, and Worship Ministry. Graduate programs include the Master of Arts in Christian Leadership degree as well as the Master of Divinity degree, which is accepted by Chaplain candidate programs for all branches of the U.S. Armed Forces. GCD’s main campus and offices are located in Fayetteville, North Carolina on the broadcast location of Manna Church, one of the top 100 fastest growing churches in the United States (Outreach Magazine, 2017). 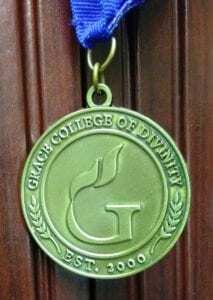 Grace College of Divinity is accredited by the Association for Biblical Higher Education, one of the four national faith-related accrediting organizations recognized by the Council for Higher Education Accreditation and the United States Department of Education. GCD is recognized by the Association of Christian Schools International (ACSI). Teachers can take our Biblical and Theological Studies courses for credit for their ACSI certification. Grace Leadership Institute was founded with the mission of providing practical and academic education and training to adults in a formal, traditional environment. This education was designed not to replace, but to complement the discipleship efforts of the local church. The curriculum was structured to prepare and equip believers; it concentrated its study and development in four particular tracks: Leadership, Worship, Ministry, and Family Life. GCD was formed in the fall of 2000 as the next logical process in the growth of this initiative, offering structured college curricula taught by faculty with years of ministry experience. The Bible is the inspired Word of God, the written record of His supernatural revelation of Himself to man, absolute in its authority, complete in its revelation, final in its content, and without any errors in its teachings. All men in their natural state are lost, alienated from God, spiritually dead: “All have sinned, and fall short of the glory of God” (Rom. 3:23). Salvation is only by grace, a free gift of God; Spiritual rebirth is the only means of salvation and eternal life through faith in the Lord Jesus, who died for our sins according to the Scriptures. Those who are regenerated are born of the Spirit, become children of God and are made new creatures in Christ (II Cor. 5:17). God is One God Who reveals Himself in three Persons-Father, Son, and Holy Spirit. Jesus Christ is the Son of God and Son of man. He was born of a virgin and is Himself God. We affirm the deity of the Lord Jesus Christ, His virgin birth, His sinless life, His miracles, His vicarious death as the only sacrifice for the sin of the world, His bodily resurrection from the dead, His ascension to the right hand of God as our intercessor, and His future return in glory. We affirm the finality of Christ’s work for the redemption of mankind and the present freedom of access to the Father. The Scriptures declare the deity and personality of the Holy Spirit as well as His present work in the church. We affirm that the baptism in the Holy Spirit is an endowment of power for all believers. The Lord Jesus Christ rose from the dead in the same body that was laid to rest in the tomb. The bodies of all believers who die will be raised from the dead, and they will receive an incorruptible body like unto His glorious body (I Cor. 15:53; Phil. 3:21). All other men shall be raised unto “the resurrection of judgment” (Jn. 5:28, 29). Christians, born of the Spirit, are to live the new life in the present power of the Spirit. “If we live by the Spirit, by the Spirit let us also walk” (Gal. 5:16-25; Col. 2:6). The Christian’s responsibility and his normal attitude of life is to yield himself to God (Rom. 6:13), trusting God to keep him. Christian “living” includes Christian service, the winning of souls around us, and the preaching of the Gospel in the uttermost parts of the earth. We affirm the sufficiency of Scripture to govern the conscience of believers. Jesus Christ will come again to earth the second time personally (Acts 1:11; I Thess. 4:16), bodily (Acts 1:11; Col. 2:90), and visibility. 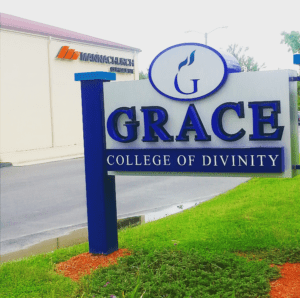 Grace College of Divinity is biblical higher education institution dedicated to Preparing Emerging Leaders to Change the World by advancing the kingdom of God through sound biblical training, practical ministry and personal development. Executive Assistant, The Rick Herrema Foundation, Inc.